Kotopita tou Kynigou , which means Hunter’s Pie, is an easy pie recipe made with leftovers from pollo cacciatore. When I made my Baklavas Tart, I had four leftover phyllo sheets and lots of leftover smaller pieces. Usually, when I have leftover phyllo I shred it into smaller pieces and make this easy Tyropita (the second recipe). However, on that day I also had some leftover Pollo alla Cacciatora (Hunter’s Chicken Stew) which was not enough for both of us, so I used the leftover chicken and leftover phyllo, added some of the cheeses I had at home and made this chicken pie. I named the pie “Kotopita tou Kynigou”, which means Hunter’s Pie, after the name of the leftover dish but you can use any kind of cooked leftover chicken, be it stewed, broiled, grilled, barbecued or boiled. I also added the cooked leftover carrots from dish. However, the addition of vegetables can be anything from peppers, corn, peas, grated carrots etc. and you will have a vegetable packed pie, great for giving to children and you will make your leftovers into the ultimate comfort food with the addition of only a few more ingredients. Remove bones and skin from cooked chicken and cut it into smaller pieces. Cut the cooked carrots into smaller pieces. In a bowl crumble feta and press the anthotyros with a fork until it crumbles. Add the eggs, spring onion, dill, carrots, chicken, salt and pepper and mix. 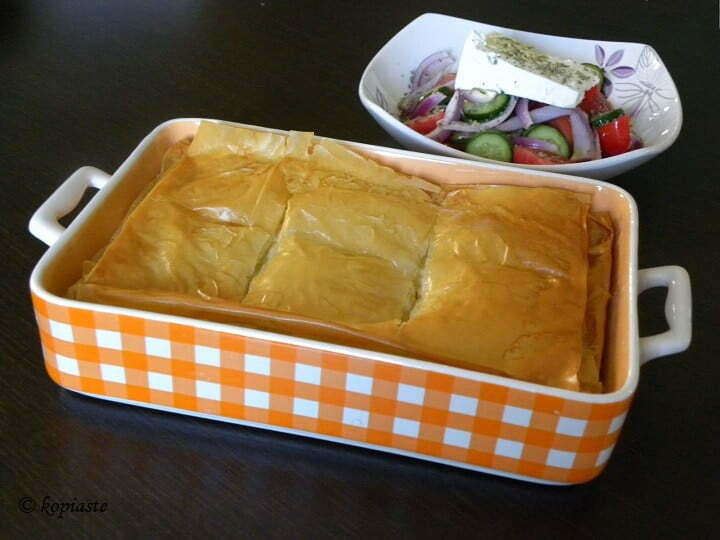 Brush a 26 x 20 cm baking dish with olive oil and layer half the sheets of phyllo, covering the sides of the baking tin and brush each sheet with olive oil. Brush half of the leftover sheets and layer them in the baking dish. Add the chicken filling and smooth the surface up. Bring the overlaying phyllo sheets on top of the filling one by one and using a slightly oiled brush, arrange one by one on top. Add the remaining leftover phyllo pieces which lightly brush with olive oil before placing them. Finally brush the remaining two phyllos with olive oil and fold them the size of your baking dish and add them on top. Slightly score the phyllos into the size of pieces you like without reaching the filling. Wet your hands with water and sprinkle the water on top of the phyllos. Bake in a preheated oven to 180o C for 35 minutes or until golden brown on top. Filed Under: Easy Recipes, Greek, Greek Pies (Pittes), Healthy Recipes, Leftovers, Main Dishes, Meat, My recipes, Pastries-pies-tarts-crumbles, Poultry Tagged With: BHMAGourmet, cacciatore pie, chicken pie, food blog awards, frugal recipes, home economy, how to use leftovers, kotopita, pollo cacciatora pie, vgfoodblogawards, Vima Gourmet Blog Awards, vimagourmetfoodblogawards. That’s a great use of leftover chicken, Ivy. This savoury filo pastry looks marvelous.